myself. I’m Lindsey and will be giving you weekly recipes you can make all summer long. My goal is to provide you with healthy inspiration, both in your life and kitchen. Healthy cooking can be simple, beautiful, and SATISFYING! Still don’t believe me? Tag along this summer and see what I’ll be cooking up in my kitchen. As we are rolling into the weekend, I am looking forward to enjoying some time off with friends and family. Secretly, what I’m most excited for is still being in my pajamas at 8am while enjoying a nice cup of coffee! I love a sweet (yet healthy!) breakfast to accompany my warm coffee, but at the same time, I want it to be easy with minimal cleanup! Anyone else with me?! After many Saturday experiments, I finally developed my favorite healthy pancake recipe. It’s one of my favorites because it’s versatile, can be dairy/gluten free, diabetes friendly, and applies to carbohydrate consistent diets. Plus, it takes less than 10 minutes including prep and cook time. I suggest playing around and having fun with the toppings. Healthy doesn’t have to mean bland and boring, so spice it up! Some of my favorite toppings include fresh berries, banana, peanut butter and maple syrup. Don’t forget to tag us on Facebook if you make the recipe. We can’t wait to hear what you think! Find the recipe posted below. 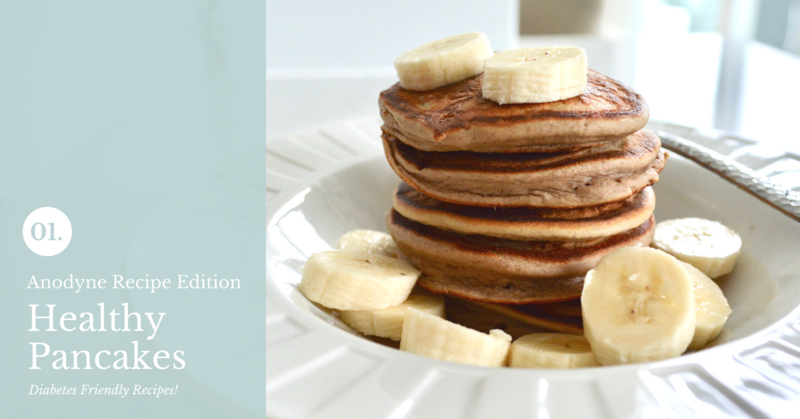 Fresh pancakes that are perfectly sweet, light and nutritious. Made with oatmeal and can be both dairy/gluten free too! Place all ingredients in the blender and blend until completely mixed and oats have broken down. Heat a large pan over medium heat and melt a teaspoon or two of coconut oil or butter in the pan. Once the pan or griddle is hot, scoop 1/4 cup of the batter onto the pan. Cook about 3 minutes (may vary depending upon heat) on each side and serve hot with extra bananas, berries, nut butter or maple syrup. ENJOY!